Do you brush your teeth daily? Do you get regular professional dental cleanings? What do you think would happen to your teeth if you didn’t brush or get them cleaned regularly? How often do you brush your pet’s teeth? When was the last time you had your pet’s teeth professionally cleaned? Periodontal disease is the most common disease in dogs and cats: About 85% of dogs and cats have some form of dental disease. Dental disease leads to bad breath, pain, infection, and tooth loss. Chronic infection can spread bacteria to the heart, liver and lungs, causing further systemic disease. Use of dental-specific treats allows your pet to use the mechanical act of chewing to help break down tartar. These products typically are made of a material that allows some contact with the teeth, to help push plaque off of teeth. Many products also contain antiseptic ingredients like chlorhexidine to help keep bacteria at bay. Oral rinses and gels can help beat plaque and tartar by remaining on the surface of teeth, minimizing bacteria and flushing away debris. Gels often are designed to stick to the surface of teeth, remaining there for 1-2 weeks. Oral rinses can be applied directly to the teeth, or some products are designed to add to your pet’s water bowl. Daily teeth brushing is the BEST way to maintain dental health. Brushing should not be done with human toothpastes, as they can often make pets sick. Pet-specific toothpastes are available from us, or can be found where pet products are sold. Pet toothpastes often contain enzymes to further inhibit plaque formation. Tooth brushing can be frustrating for both owners and pets, especially if you’ve never done this. We recommend starting a tooth-brushing regime slowly, so your pet learns to accept it, and so that you do not become frustrated. Essentially, you must teach your pet, through positive reinforcement, to enjoy getting their teeth brushed. Start by just getting your pet used to something being in it’s mouth. We suggest to start by running your index finger along your pet’s teeth. You’ll have the most control with your finger, versus a brush. Start at one swipe per quadrant (the whole experience may only last 10 seconds). Do this several times over the course of the day. Praise your pet when they accept this. Slowly work up to a longer amount of time, such as 30-60 seconds, mimicking brushing. You can even dip your finger in broth, bouillon water, or tuna juice to entice your pet. Once your pet accepts your finger, graduate up to a rag or gauze around your finger, still without paste. Again, work with your pet to accept this new texture, as in Step 1, until you’re doing it for longer periods daily. Once your pet accepts that, graduate up to a finger brush or infant toothbrush, still without paste. Once again, gradually work up to longer amounts of time until you reach 1-2 minutes. Once you are able to brush for 1-2 minutes, you can either graduate to a regular or veterinary toothbrush (has an extended handle), or introduce toothpaste at this step. You may need to repeat Step 1 for your pet to accept toothpaste. In all steps, do not be discouraged. Each pet is different and will accept different things, for varying amounts of time. If you get frustrated, you are likely to stop, so just take it slowly. Praise your pet after each exercise, every time after brushing its teeth. Soon, this will become something you and your pet do to achieve a healthier life for your pet! As always, feel free to contact us if you have any questions about your pet’s health! 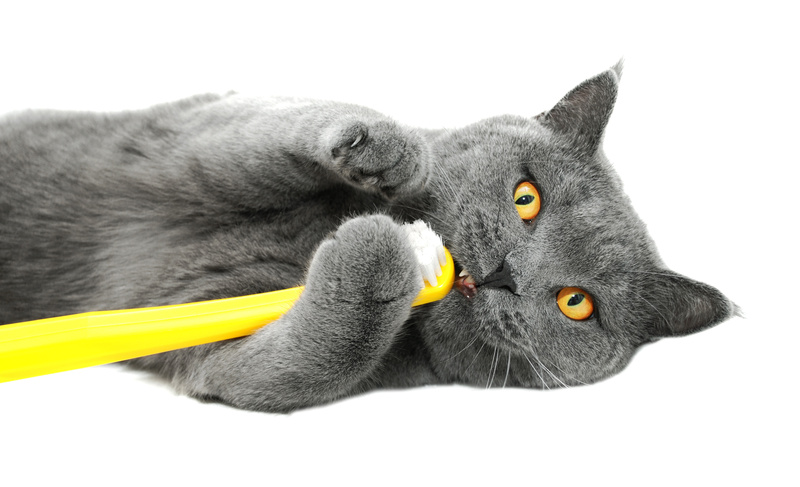 Also, check out our website for helpful videos on how to brush your pet’s teeth. Finally, we have great dental care products and can help you figure out what’s best for you and your pet.